» Don’t be afraid. Don’t Eat Off The Sidewalk! I hate confrontation. Thanks to years of emotional abuse, i’m absolutely terrified of people yelling at me. The people who live around the corner have a dog that they leave out all day and night, seven days a week. I’d be surprised if the dog had ever seen the inside of their house. He has no social skills at all, Bonny understands english more than he does. It’s not his fault though, he doesn’t get any interaction. He doesn’t make much noise during the day, but when it gets dark he barks for a least twenty minutes straight out of every hour. But last, I was in the kitchen making tester recipes for Joanna, and he would. Not. Stop. I listened to his barking for an hour, over my radio. When I called the cops I had a headache and was so tense I thought I was going to chop my fingers off. I talked with the officer, he went over there first and they didn’t even answer! Maybe it’s a family of deaf people. That would explain how they get any sleep. He went back and banged on the door until someone answered. I think they just put the dog in the garage because I can kind of still hear him, although he’s not barking as much. The good news is, now that they’ve been warned (animal noise is against the law here), if the cops get called again, they get fined. Boo-yah. Then I ended up not being able to sleep anyway because someone elses dog started barking at four am. I’m going to go buy some ear plugs today. Anyway, here is what I made yesterday. 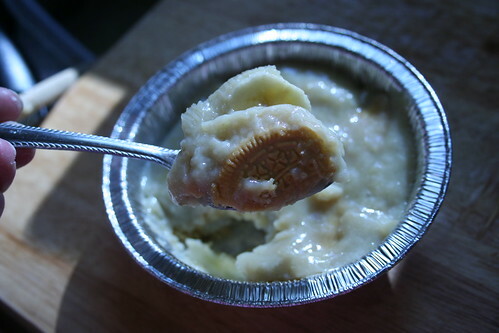 I did the mini-banana puddings with my leftover cookies. I made two in pot pie tins. They were much more appealing than the one that took a three hour tour (a three hour toooooour) in the trunk of the car. The cookies weren’t complete mush and I put a higher ratio of mushed banana in the pudding so it tasted better. Then I went to the store armed with a list to crank out some more tester recipes for Joanna. I go through testing spurts. 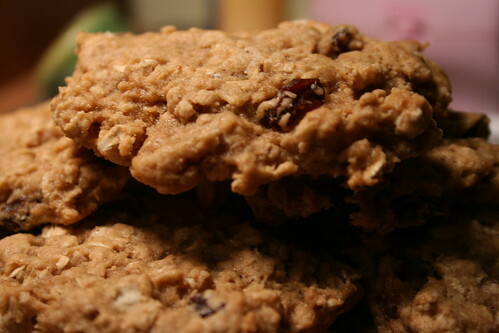 First, I made soft oatmeal cookies. They meet not just my approva, but my husbands as well. He will try almost anything I shove at him, but for him to ask for another one is a miracle. 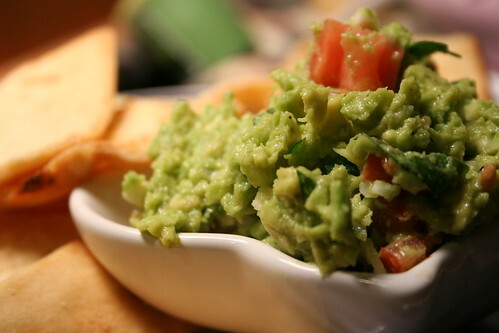 Then, in between cookie batches (and with a brief recess for the police calling), I made her guacamole. I brought the cookies and guacamole in here to take pictures before I even tasted it, and it’s a good thing I did because I probably would’ve eaten it all before I got the camera out! So so so so good. So good. If you’re a tester of hers, you really have to go make this. I’m going to make more today. I bought fresh corn to make corn chowder. Oh yeeeeeeeeeeah.